With four months on the books, the state’s revenue picture is becoming clearer and the situation continues to be encouraging. According to the most recent Department of Administrative Services’ Monthly Revenue Focus, FY 2016 total General and Education Fund revenue is exceeding expectations, as outlined by the Department’s Revenue Plan, by nearly $20 million through October. While the state has over a dozen streams of revenue, three – business taxes, the meals and rooms tax, and the real estate transfer tax – are doing the heavy lifting. 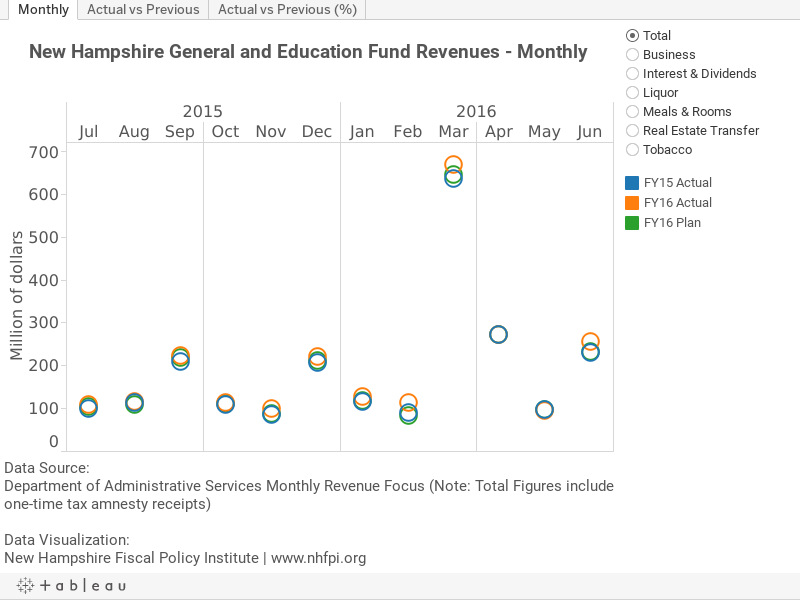 Given that New Hampshire’s General and Education Funds have received only about one-quarter of what they will eventually collect for the current fiscal year, it is still too early to expect these trends will hold through next summer. Nevertheless, collections during the last four months suggest that New Hampshire is on track for a strong year, especially since the economic outlook is likely to remain stable, if not somewhat improve. The following data visualization is designed to help you understand these data. Within each tab, you can hover over each data point to view additional context. On the right side are seven radio buttons, which allow you to further investigate revenue trends by specific tax type or by total collections.